UPDATE: Jackson will resume his duties as the White House doctor. 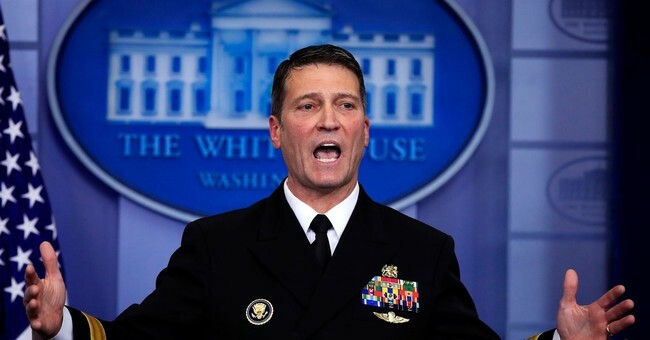 "Admiral Jackson is a doctor in the United States Navy assigned to the White House and is here at work today," White House Press Secretary Sarah Sanders released in a statement Thursday morning. U.S. Navy Rear Admiral and longtime White House Doctor Ronny Jackson will not become the next Secretary of Veteran's Affairs and pulled his name from consideration Thursday morning. He was nominated by President Trump for the position in March. "Going into this process, I expected tough questions about how to best care for our veterans, but I did not expect to have to dignify baseless and anonymous attacks on my character and integrity," Jackson released in a statement. "The allegations against me are completely false and fabricated. If they had any merit, I would not have been selected, promoted and entrusted to serve in such a sensitive and important role as physician to three presidents over the past 12 years. In my role as a doctor, I have tirelessly worked to provide excellent care for all my patients. In doing so, I have always adhered to the highest ethical standards." "Unfortunately, because of how Washington works, these false allegations have become a distraction for this President and the important issue we must be addressing – how we give the best care to our nation’s heroes," Jackson continued. "While I will forever be grateful for the trust and confidence President Trump has placed in me by giving me this opportunity, I am regretfully withdrawing my nomination to be Secretary for the Department of Veterans Affairs. I am proud of my service to the country and will always be committed to the brave veterans who volunteer to defend our freedoms." During an interview with Fox and Friends Thursday morning and shortly after the news of Jackson's withdrawal broke, President Trump called the accusations "completely false" and said political enemies are trying to destroy him. "He would have done a great job, he has a tremendous heart...These are false accusations, they are trying to destroy a man," Trump said. The move comes after allegations of professional misconduct, which included drinking on the job, wrongful disbursement of prescription drugs, treating staff poorly and more were brought to the attention of the Senate in news reports. His confirmation hearing, which was set for Wednesday, was delayed. Less than 24 hours ago Jackson was vowing to put up a fight to clear his name and said he looked forward to answering questions from senators during his confirmation process. The White House has repeatedly denied that any of the allegations are true and said they did not come to the attention of the president during the vetting process. During the daily briefing on Wednesday, Press Secretary Sarah Sanders touted Jackson as one of the most vetted candidates to be nominated for the position. "He's a highly qualified individual," she continued. President Trump also praised Jackson yesterday, who also received excellent recommendations from from President Obama, while giving him a way out of the position. "I told Admiral Jackson just a little while ago, I said, 'What do you need this for?' This is a vicious group of people [Senators] that malign and they do. And I've lived through it. We all lived through it," Trump said. "He's an admiral. He's a great leader. And they questioned him about every little thing. What he is is a leader and a good man. But I told him I said, 'You know what, Doc? You're too fine a person.' His son is a top student at Annapolis. He's a high-quality person. I said, 'What do you need it for?'" "So he'll be making, it's totally his decision, but he'll be making a decision,' Trump continued. "He's a fine man. I'll always stand behind him. I'd let it be his choice." No word on who President Trump will nominate to replace him. This is a breaking story, stay tuned for updates. This post has been updated with additional information.